Side Imaging vs Down Imaging: How to Use Them to Catch More Fish? How Side Imaging & Down Imaging Works? If there’s one thing we are sure of when we get to the water is that when we see fish, we can catch them. And if you can’t see them on your sonar unit, then the odds of you catching fish would be very low. Fortunately, side imaging and down imaging sonar were invented to allow us to see and catch more fish than traditional sonar. Hence, before installing your fish finder, you should read this guide to understand how side imaging and down imaging works to make optimum use of these awesome technologies. If you need to know more about fishfinders then this guide will definitely help you. First, What Is Side Imaging And How Does It Work? How to Use Side Imaging to Identify Fish? So how do you Know How Hard the Fish is In the Water Column? Down Imaging And How Does It Work? How to Use Down Imaging to Identify Fish? Side Imaging is a revolutionary sonar technology that makes your time on the water more productive. Side imaging sonar uses a razor-thin beam that projects deep into the water to both sides of the boat with broad coverage across the bottom. Although side imaging looks like photos, it doesn’t depend on light or darkness. The best part is that natural structure, submerged wreckage, and even bait fish can be clearly seen when using side imaging. Moreover, silt and mud will not interfere with side imaging. A reputable brand like Humminbird lets you run side imaging in fresh and salt water in depth as shallow as 2 to 3 feet. Unlike traditional sonar, side imaging moves from top to bottom instead of right to left. What does that mean? It means your recent images will be at the top of the screen with your history moving towards the bottom. One of the easiest structures with side imaging is to look for shadows. Most objects standing at the bottom typically as a bright spot, immediately turn to dark sonar shadow. This shadow is caused by the object reflecting the sonar energy, which often tells you more about the height and shape of the subject matter than the first sonar reflection. Interestingly, side imaging also shows you schools of bait fish that will appear as a cloud or cluster of small white dots. Most brands offer side sonar imaging that shows larger individual fish as little white lines or streaks on the screen. In the case of Humminbird side imaging, anytime you see a white hot streak with the shadow behind it, then you know that there is a fish. You can know this by taking note of how far the shadow is from the fish. You can know the number of feet the fish is in the water column. The fish are going to appear on the large return of the side imaging sonar, which will project the fish as a white hot streak or a bright white beam. You can easily tell the difference between water structures and fish. When you see a limb or a stick, or something underneath your boat, you can easily tell what it is because of its dullness. The reason why it is dull is that it doesn’t project a bright beam based on the fact that it is hitting a soft return. A fish, on the other hand, comes with a hard return and are really bright. Down Imaging sonar features both the traditional down sonar with the side sonar imaging to deliver a picture-like image of underwater structures underneath your boat. A good example of a brand that provides this function is the Humminbird down imaging. Down imaging is identical to your traditional sonar returns and moves right to left with current information appearing on the right side of the screen. Down imaging sonar technology will help you confirm and identify structures below the boat. You can also use it together with switch fire, and side imaging, making it an all-in-one tool to help you catch more fish. While the side sonar picks up structures that are not under the boat, but a little further off the side, the down imaging sonar will show those structures that are directly beneath you. So with that information, you can see the weed line very easily and know how far if you want to have a closer look. Unlike the 2d sonar, you can clearly distinguish between structures and fish. You can actually draw the picture out and know whether it is a bunch of tree limbs or fish. Another nice thing about down imaging is that you can verify fish and catch them easily. Down Imaging sonar sends you down to the clearest view you can have of everything below me. The down imaging sonar will also give you the confidence and the most unobstructed view to know whether what you saw is actually a fish or not. Let’s assume that you have set up your 2d sonar mode while cruising around the water looking for fish. As soon as you find something that really interests you down at the bottom, the next thing you want to do is to switch to your down imaging quickly. A pro tip is to always have your down imaging and side sonar with you. Also, make sure you set up your range identically on both screens. One thing you have to keep in mind is that if you go with the 2d sonar and pop over to your down imaging, you have to be on the move because it’s sending out a very thin beam to take that clear picture for you. If you are sitting still, then it is not going to give you everything you are looking for. But the fact remains the same that side and down imaging sonar allows you to see more fish compared to traditional sonar. During our testing, we were able to see more catfish than we would in traditional 2d broadband sonar where we saw no fish. 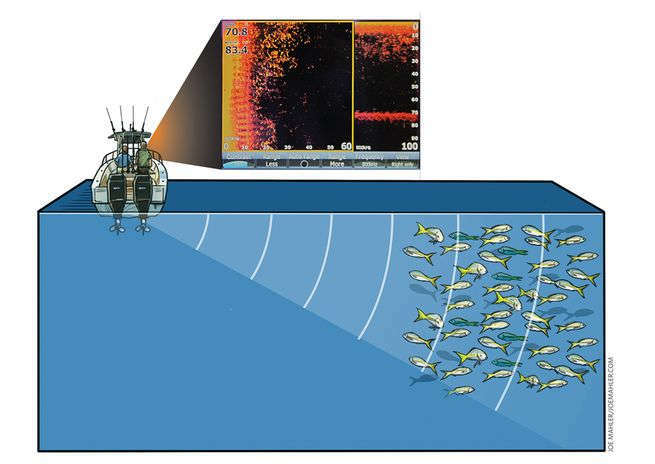 With the use of side sonar and down sonar, you’ll see more fish projected on the screen. These are great search tools that we use on a daily basis. If you use them, you are going to catch more fish. Hello! My name is Andrew Barns. I'm an avid Angler. I started this blog to help all my friends with new info in the fishing world. I'll also write some product reviews to help you guys make correct decisions while buying your gears. TrickATrout.com is a participant in the Amazon Services LLC Associates Program, an affiliate advertising program designed to provide a means for us to earn fees by linking to Amazon.com and affiliated sites.